If you’ve ever said that – or thought it – think again. There's a better way to create profitable, effective on-line learning programs. Change “on-line courses” to “on-line learning”. Change “a billion people on the Internet” to “my current clients”. Completely replacing your existing face-to-face programs with on-line programs is a big step, and it’s difficult. You’re already an experienced presenter, you have tried-and-true programs, your clients and audiences love you, you’ve got comfortable (even if not entirely happy) with the logistics of running an event, and you’re getting well-paid for these programs. Now I’m not saying you never need to throw out the old in order to usher in the new. After all, the railway companies of the early twentieth-century made that mistake – they could have been the airlines of the twenty-first. But that’s my point: You don’t need to throw it out. Simply enhance your face-to-face programs with electronic components. Over time you’ll keep adding more bits and pieces, and perhaps even some day decide you don’t need the face-to-face components at all. Or not – you might be completely happy with a blended solution forever. Enhancing your existing programs means there's a smaller learning curve, it's a smaller sale for your clients to buy into and you increase your current fees. In the early days of e-learning – about, oh, 2005 – it became more common for speakers and trainers to offer “on-line courses” to supplement their face-to-face programs. In brief, an “on-line course” was a series of e-mail messages sent to program attendees after their program, to help reinforce the ideas they learned in the program. Of course, the messages had to be sent automatically, because different people would be receiving them at different times. In the days before Facebook, Ning, Web 2.0, blogs and Twitter, this was very effective. But now, audiences and clients expect more than a series of e-mail messages. You can include videos, audio, iPhone apps, a password-protected membership site, self-assessment surveys, progress reports to managers, and much more. That's why we call this "e-learning" now, and that encompasses much more than just an e-mail course. It’s hard work selling anything on the Internet, as you would know if you’ve tried it. So the advice I give 99% of the time is to market to your existing clients and customers, rather than to strangers on the Internet (The other 1% of the time is the rare client who does understand what’s really involved in Internet marketing, and is willing to make the investment to make it work). Most business owners want to target strangers, because they are the largest group. However, they are also by far the most difficult to reach, attract and convert into paying customers. 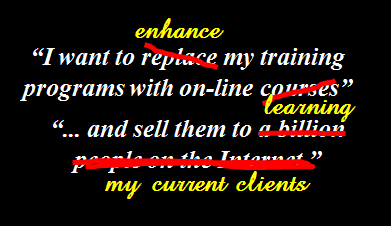 That’s why I recommend you start your e-learning journey by building programs for your existing clients. This applies to all your products and services, but especially for on-line learning, which many people aren’t familiar with.